1. The stone plastic floor products produced by the SPC floor production line are green and environmentally friendly. They do not contain formaldehyde and other non-toxic and harmless, no radioactive pollution, and are environmentally friendly and environmentally friendly products. They can be recycled and reused. 2. Product Super wear resistant: surface wear resistant layer in the same product thickness * high strength, 3. Polymer stone plastic wear resistant layer service life. Waterproof, moisture-proof, water without deformation, non-slip PVC material, strong slip, can eliminate the concerns of the elderly and children. 4. The stone floor products produced by the SPC floor production line are tough and elastic: resistant to impact and comfortable feet. 5. High safety, insulation, flame retardant, corrosion resistant, acid-base resistant, 5 % acetic acid. 5 % hydrochloric acid, the surface is no different. Five seconds away from the flame will extinguish itself. 6. The color is novel, a variety of colors are available for selection, the color is brilliant, natural and realistic, and the arbitrary composition of the color shape, highlighting the personality color. 7. 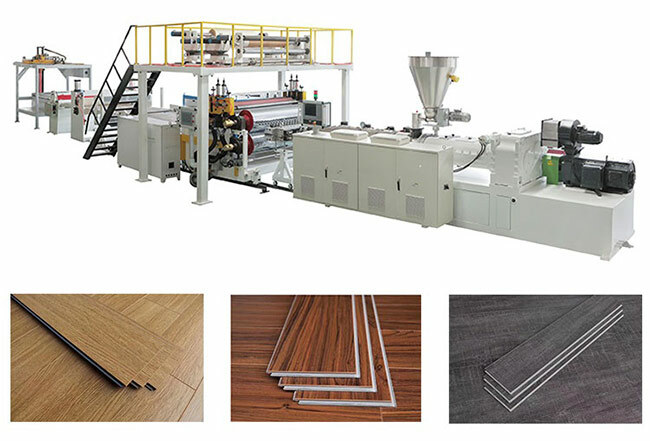 The installation is quick and convenient, Shigongfangbian can saw, planer, nail, adhesive free paint. 8. The service life can reach more than 20 years.